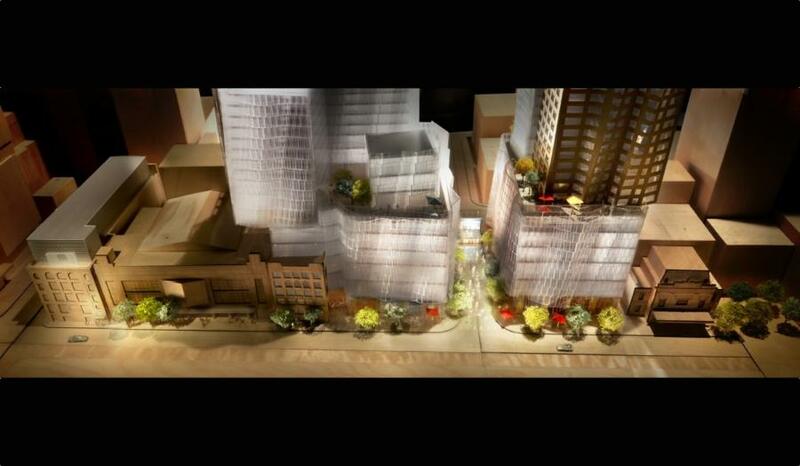 Mirvish + Gehry Toronto Condos - Two Iconic Towers Coming Soon! Mirvish + Gehry Toronto Condos is a new mixed-use residential condominium development currently in pre-construction at 260-322 King Street West in downtown Toronto, Ontario by Frank Gehry & Great Gulf. It consists of two proposed towers of 82 and 92 storeys with a 6-storey podium and 1,949 residential dwelling units. David Mirvish is the son of the late Ed Mirvish who owned the discount department store "Honest Eds". He owns and operates many theatres in Toronto and overtook Mirvish Productions in 1987 "for the purpose of administering and producing shows for Toronto's historic Royal Alexandra Theatre". The Princess of Wales Theatre was another project by David Mirvish in 1993. Mirvish began a new business venture in 2000 as a real estate developer and began construction of a large condominium known as One King West. Great Gulf has over 20 years of experience and has "provided the best engineers, project and development managers, real estate developers and construction workers to property owners". They have constructed projects both big and small including different types and sizes of the development. Some of their projects include: Monde Condos at East Bayfront, Whitby Meadows in Williamsburg, 8 Cumberland in Yorkville, Home Power Adelaide in Corktown and coming soon is 101 Spadina in the Entertainment District. World-renowned architect Frank Gehry grew up in the Toronto neighbourhood and established his practice in 1962 in Los Angeles, California. The Gehry Partners, LLP was formed in 2001 employing senior architects with extensive experience. They have approximately 100 staff members in their architectural firm "with extensive international experience in the design and construction of academic, museum, theatre, performance and commercial projects". Frank Gehry personally undertakes all designs in every project including the redesign of the Art Gallery of Ontario in 2008. This collaboration from Great Gulf and The Gehry Partners, LLP will result in the Mirvish + Gehry Toronto Condos - a living urban community close to the finest art, culture and design life that Toronto has to offer. Register with us today for more details on this incredible project!